Hedgehog in the Fog (Russian: Ёжик в тумане, Yozhik v tumane), is a 1975 Soviet animated film directed by Yuriy Norshteyn, produced by the Soyuzmultfilm studio in Moscow. The 10 minute video has been recognized again and again as a significant work in the history of animated film. A hedgehog and his friend bear cub meet every evening to drink tea, converse, and count the stars. One day, the hedgehog decides to bring raspberry marmalade. As he went to the bear to count the stars, he passes through the woods and finds a horse standing in a fog. 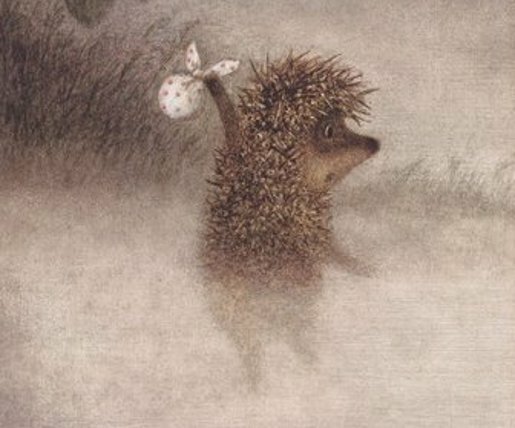 Curious about the potential impact of fog on a sleeping horse, the hedgehog enters the mist, finding a strange world inhabited by many frightening creatures, the eagle-owl and the bat, along with helpful and kind ones. Hedgehog in the Fog was developed by director Yuriy Norshteyn (Юрий Норштейн), writer Sergey Kozlov (Сергей Козлов), art director Franchesca Yarbusova (Франческа Ярбусова), animator Yuriy Norshteyn (Юрий Норштейн), camera operator Alexandr Zhukovskiy (Александр Жуковский), composer Mikhail Meyerovich (Михаил Меерович), sound operator Boris Filchikov (Борис Фильчиков), script editor Natalya Abramova (Наталья Абрамова), film editor Nadezhda Treshchyova (Надежда Трещёва). The Russian script was written by Sergei Grigoryevich Kozlov, who also published a book under the same name. In 2006, Norshteyn published a book with the same name, listing himself as an author along with Kozlov. The fog effects were created by putting a very thin piece of paper on top of the scene and slowly lifting it up toward the camera frame-by-frame until everything behind it became blurry and white. Voice actors were Alexei Batalov (Алексей Баталов) Narrator, Mariya Vinogradova (Мария Виноградова) Hedgehog, and Vyacheslav Nevinny (Вячеслав Невинный) Bear. In 1976 Hedgehog in the Fog was recognized as “Best Animated Film” at both the Frunze All-Union Film Festival and the Tehran Childens and Youth Film Festival. In 1977 it won Outstanding Film of the Year, London. In 2003 Hedgehog in the Fog was recognized as Number One Animated Film of All Time at Tokyo All Time Animation Best 150. 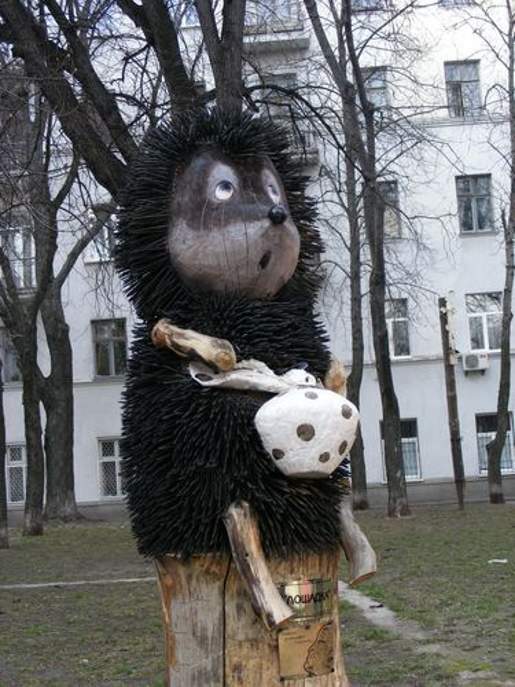 The Hedgehog can be found as a statue in the city centre of Ukraine, Kiev, erected in January 2009. Photo via Natalia Lyubelchuk at Panoramio/Google Earth.